Jacob Hanna/Pipe Dream Photographer Jumaane Williams, Democratic candidate for New York lieutenant governor, visits Spotlight in Downtown Binghamton on Sept. 11. 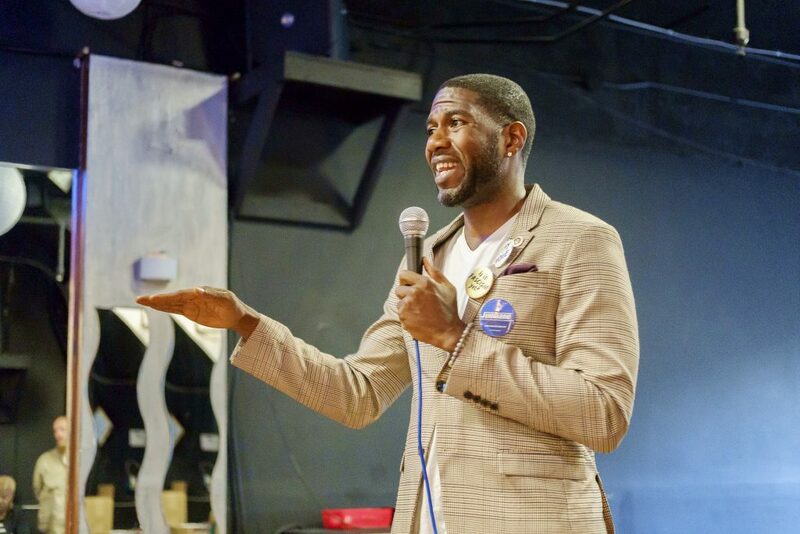 Jumaane Williams, Democratic candidate for New York lieutenant governor, made a stop at Spotlight in Downtown Binghamton on Sept. 11 to meet with locals and discuss his platform. Currently, Williams is running alongside Cynthia Nixon, a gubernatorial candidate running against Gov. Andrew Cuomo for the Democratic nomination. A graduate of Brooklyn College, Williams has served as a member on the New York City Council for the 45th district, which includes East Flatbush, Flatbush, Flatlands, Marine Park and Midwood in Brooklyn, since 2010. Prior to his career on the New York City Council, Williams was the executive director of New York State Tenants & Neighbors, a grassroots organization that advocates for Section 8 tenants facing buyouts and higher rents. Some of Williams’ major platform points include advocating for women’s reproductive rights, reforming the criminal justice system, fighting climate change and preventing gun violence. According to his website, he will prioritize the codification of Roe v. Wade in New York, ending cash bail, conserving land and implementing gun control reform if elected. Previously, Williams chaired a New York City Council task force to combat gun violence and founded the National Network to Combat Gun Violence, according to his website. He also aims to make education reforms and has pledged to make Cuomo’s Excelsior Scholarship more accessible to students. During the Q&A session, one attendee asked Williams his position on supplying defense attorneys for those who cannot afford them. Williams said he supports funding legal assistance programs. According to Steven Doolittle, an intern at Citizen Action and a third-year graduate student studying social work at BU, his organization endorsed Williams because of his strong dedication to the community and support for human rights. “What really stuck out to me is that a lot of his agenda really focuses on just opening up more with the community and making that connection basis that really focuses on human rights versus what we’ve seen in the past,” Doolittle said. Derek Scott, 47, of Endwell said he hopes to see Williams implement legislation at the state level to combat controversial national policies. Democratic local and state primaries will be held on Sept. 13. Williams and Nixon will not share a ballot on Thursday, but they would if they are nominated for the general election.